The giant African land snail can grow up to eight inches long. To accompany our invasive species cookbook, we're also posting the risks of eating certain invasive species when improperly consumed. Read more about the culinary approach to preparing invasive species. Giant African land snails are eaten as bar snacks in Nigeria. WLRN-Miami Herald News reporter Kaylois Henry snagged a recipe for giant African land snail stew from Sheri Restaurant, a restaurant in Opa-Locka that serves mostly Nigerian dishes. Co-owner Margaret Lanier said that Sheri Restaurant used to serve land snail dishes until Nigerian imports became too costly. So could the wild critters running rampant in South Florida provide an economic solution for restaurants like Sheri, as well as for adventurous eaters? Well, it depends. The snails may carry diseases such as meningitis. "Green Deane" has been foraging wild plants and animals for most of his life. He shares his knowledge on the website Eat the Weeds and in classes he teaches around Florida. In a post on Eat the Weeds, Green Deane writes, "When raised in captivity as pets or food, (snails) are fed a diet of lettuce, chicken feed, and commercial snail food. They’re also cooked, sliced, canned and sold as escargot. " He advises that if people are tempted to eat wild snails, they should, "purge them, feed them wholesome food, wear latex gloves while handling, and cook very, very thoroughly." Purging the animal means feeding it wholesome food long enough to clean toxins (like commercial pesticides) from its system and rid it of bad flavors. Green Deane didn't make this up. Paul E. Skelley, an entomologist with the Florida Department of Agriculture and Consumer Services, said that is standard practice for many wild animals. "If purged of toxins and bad flavors, they may still harbor parasites, thus they need to be cooked well," Skelley said. "Most of the infections and deaths from snail-transmitted diseases apparently come from eating raw or undercooked snails or ingesting slime residue left on fresh fruits and vegetables." "What I’ve seen of the process to make even healthy snails edible is more work than it is worth... In my opinion, eating wild snails should only be done in an ‘eat-snail-or-die’ survival situation," he said. 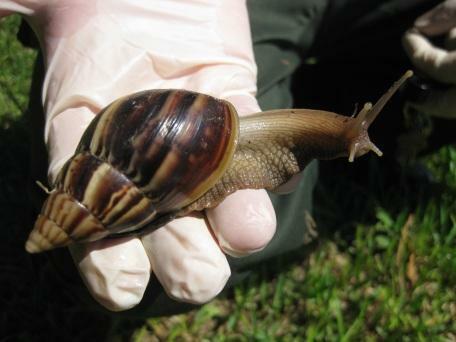 Skelley adds: "It is presently illegal for anyone to go into a giant African land snail quarantine area, collect and remove them--without a federal permit--even if they are to be killed and eaten." However, if you are interested in eating other types of snails, Skelley suggests eating other invasive snails in Florida. But potential problems with parasites and toxins remain the same. "Many of our native or naturalized snails can harbor the same diseases as giant African land snails. When eating any wild animals, take your chances regarding toxins (or know they were grown in a clean environment), purge if possible, clean, season as desired, cook well to kill parasites and diseases, and bon appetit."